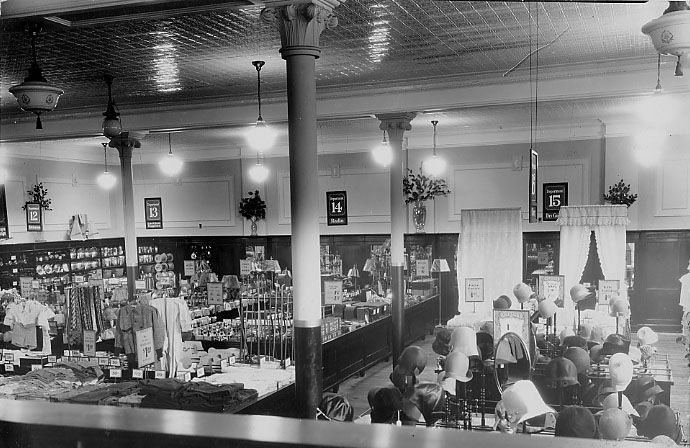 Interior of the department store next door to Kay's in Lima. The photo was taken about the time of the robbery. Sgt. Richard Rivers was unaware members of the gang were outside Dr. Rose's house. While Brady, Geiseking, and Dalhover went into the store and held it up, Shaffer remained in the car as its driver. As the robbery unfolded, a police car pulled up and parked in front of the gang car and one of policemen got out and went into a 5- and 10-cent store next door. Just as he entered, Dalhover came out of the jewelry store with four pillow cases full of jewelry. Seeing the police car but no movement from the officer behind the wheel, Dalhover might have theorized the officer just happened upon the scene and so he placed the jewelry in the gang car and picked up an automatic rifle. Brady, meanwhile, was exiting the jewelry store and, seeing the police car and Dalhover pick up the rifle, placed his bags of jewelry in the car and drew his revolver. They approached the police car from opposite sides and as Dalhover pressed the barrel of the rifle against the policeman’s head, he removed the officer’s gun. As Dalhover was pocketing the weapon, the second policeman exited the five and dime, saw what was happening, and opened fire on Brady and Dalhover. Just as the shooting began, Geiseking ran out of the jewelry store and was shot in the leg by the policeman standing in the five and dime doorway. When the officer ducked back into the store to reload, Dalhover helped Geiseking into the gang car, while Brady retrieved a bag dropped by Geiseking. The gang sped away, but the two Lima officers, Patrolmen Jess Ford and Edward C. Swaney gave chase. During the pursuit, the police car failed to make a turn and the car crashed, seriously injuring Swaney. The gang returned to Indianapolis and took Geiseking to the home of Dr. E. E. Rose at 2153 Barth Ave., arriving at about 5 p.m. They told Rose that their friend had been shot by a jealous husband and none of the parties wanted police involvement. Rose agreed to treat Geiseking but did not remove the bullet, telling them they should bring him to a hospital. They assured the doctor they’d take care of it and left. Suspicious, Dr. Rose noted the license number of the vehicle and notified police after they left. Follow-up investigation determined that men of the suspects’ description had held up the jewelry store in Lima at about 9 that morning. Surprisingly, Brady, Shaffer and Dalhover returned to Dr. Rose’s home just before 9 p.m. While two waited in the car, one went inside and attempted to persuade the doctor go with him to see the wounded man. Dr. Rose refused, and as they argued, Mrs. Rose ran out a back door to a nearby drug store and called police. Neither the doctor nor his wife knew two other gang members were outside. Sgt. Richard Rivers and his squad were a block away when they received the call. They went to Rose’s house and, not knowing there were two suspects outside, jumped from the police car and ran toward the house. As they did this, the two suspects outside opened fire. A moment later, the suspect inside the house also started shooting at the police. Rivers managed to fire two shots before he was fatally wounded. Two other responding officers, Officers Chambers and Sansone, managed to get back into their car. Shots were exchanged for a few more seconds before the suspects sped away. The third suspect, who was inside, ran to the back of the house and escaped through a window, cutting himself in the process. Police attempted to chase the fleeing vehicle, but lost it at Stones Crossing, about 15 miles south of Indianapolis. A state-wide manhunt was begun, and a door-to-door search was made for the one of foot, but all three managed to escape. Rivers was 44 and had a wife and two children.